The Trademark Trial and Appeal Board (T-T-A-B, not Tee-tab) has scheduled three (III) oral hearings for the month of February 2019. 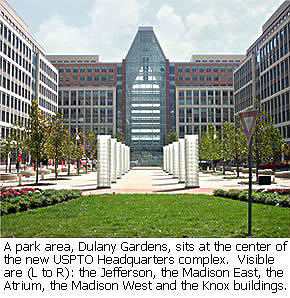 The hearings will be held in the USPTO's Madison Building in Alexandria, Virginia. Briefs and other papers for these cases may be found at TTABVUE via the links provided. February 7, 2019 - 11 AM: In re Central Dynamics, LLC, Serial No. 86906610, 86906682, and 86862221 [Section 2(e)(1) mere descriptiveness refusals of ECONCIERGE (standard characters) for “Platform as a service (PAAS) featuring computer software platforms for hotels, resorts, casinos, hospitality and transportation providers to communicate with and support guests before, during and after stays regarding preferences, profiles, planning and management of stays, dining, transportation and activities; providing temporary use of online non-downloadable software for hotels, resorts, casinos, hospitality and transportation providers to communicate with and support guests before, during and after stays regarding preferences, profiles, planning and management of stays, dining, transportation and activities;" EPROPOSAL (standard characters) for "Platform as a service (PAAS) featuring computer software platforms for hotels, resorts, casinos, hospitality and transportation providers to create, send, monitor and track responses to requests for proposals; providing temporary use of online non-downloadable software for hotels, resorts, casinos, hospitality and transportation providers to create, send, monitor and track responses to requests for proposals;" and EMENUS in the stylized form shown below, for "Providing temporary use of on-line non-downloadable software for data base management by hotels around the world to enable their clients and guests to see online menus and photos of meals to order"]. February 12, 2019 - 10 AM: In re DJ Direct Inc., Serial No. 87542492 [Section 2(d) refusal of VYSTA for "Fitted picnic baskets, including dishes, cooking forks, hand-operated meat tenderizer claws in the nature of forks used for shredding and serving meat, cooking skewers, corn cob holders" in view of the registered mark VISTA for "pitchers"]. February 12, 2019 - 11:30 AM: Mars, Incorporated v. PAGS Inc., Opposition No. 91221462 [Opposition to PET-AGREE for " Wholesale and retail supply store services featuring pet grooming supplies; online wholesale and retail supply store services featuring pet grooming supplies" on the grounds of likelihood of confusion with, and likelihood of dilution of, the registered mark registered mark PEDIGREE for pet food and ancillary products and services]. Thank you for this! Every time I hear one of the patent guys say "tee-tab," I want to slap them. I hardly ever do. "T-T-A-B, not Tee-tab" ... THANK YOU!!! Emenus in a color stylized form is not generic. The mark is not minimally styled. Applicant should be allowed to disclaim, if 2(f) is not sufficient. That said, Applicant has 15 years of use for its "E"-marks. Board will say 2(f) evidence is insufficient, but suggest disclaimer in buried footnote. VYSTA refusal will be affirmed. PET-AGREE opposition will be sustained on LOC, but no dilution.